I've been dreaming about pizza and salad all day. 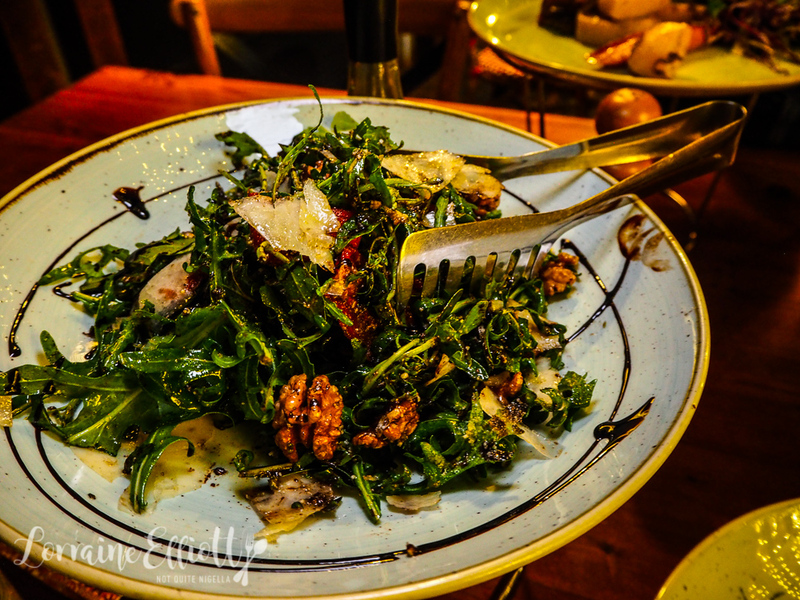 Yes Dear Reader, the embarrassing truth is that I adore salad and that I've had Capanno's rocket salad before and loved it so much I ate three serves of it. And I couldn't wait to eat it again. I am meeting my cousin Richard, who first introduced me to Capanno's at his birthday party. They had catered for his big bash and the food was great. There was roast pork with melting meat and crunchy crackling and the rocket salad that had me going back again and again. He suggested that we go there one night. 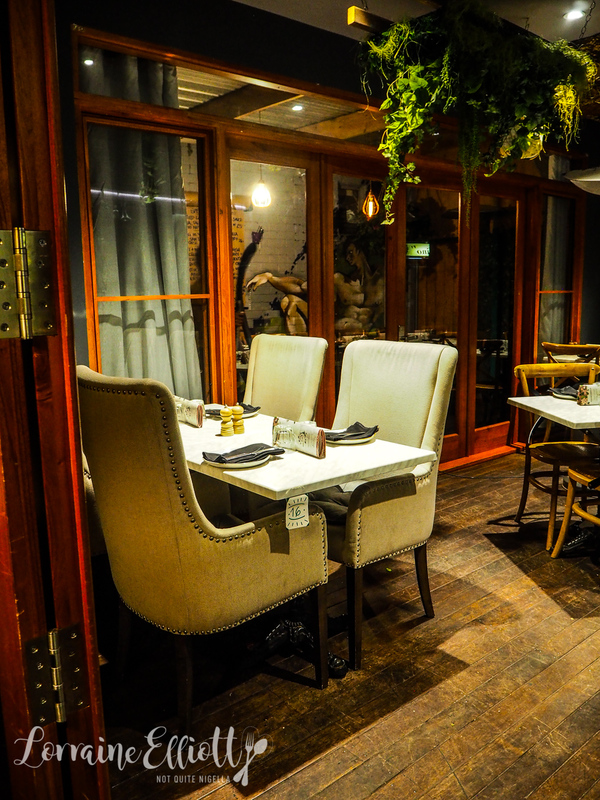 Capanno's has been around for 30 years but with new owners in the past three years. Our table for 7 people has had some attrition. Mr NQN had to work back late so he couldn't make it and Richard's friends had cancelled that afternoon for various reasons but that left three of us with his friend Iris arriving. And we were all hungry. 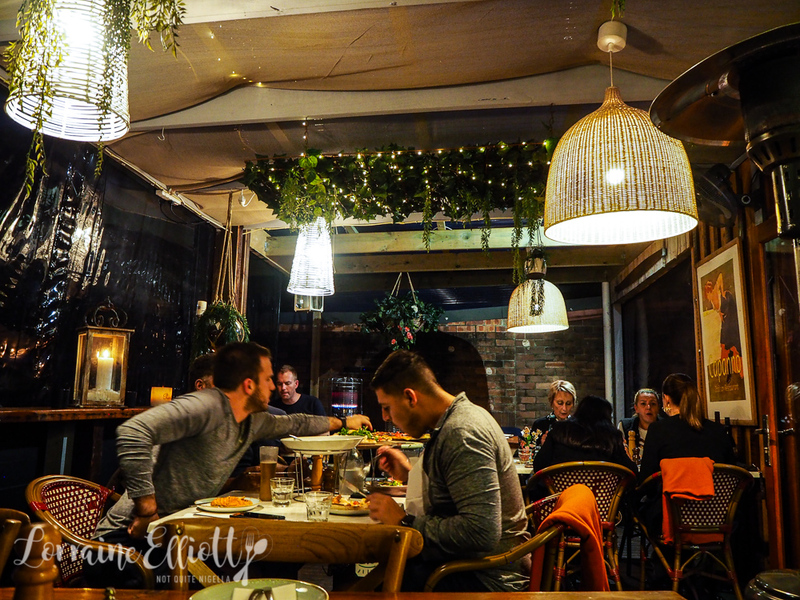 Eating out with new people can be a challenge where you discover people that have strange food preferences or allergies but not with the three of us as choosing is swift and consensual. It's so easy I feel almost jubilant. Service is friendly and accommodating. The arancini might seem relatively pricey for 3 balls but they're large balls and worth ordering. 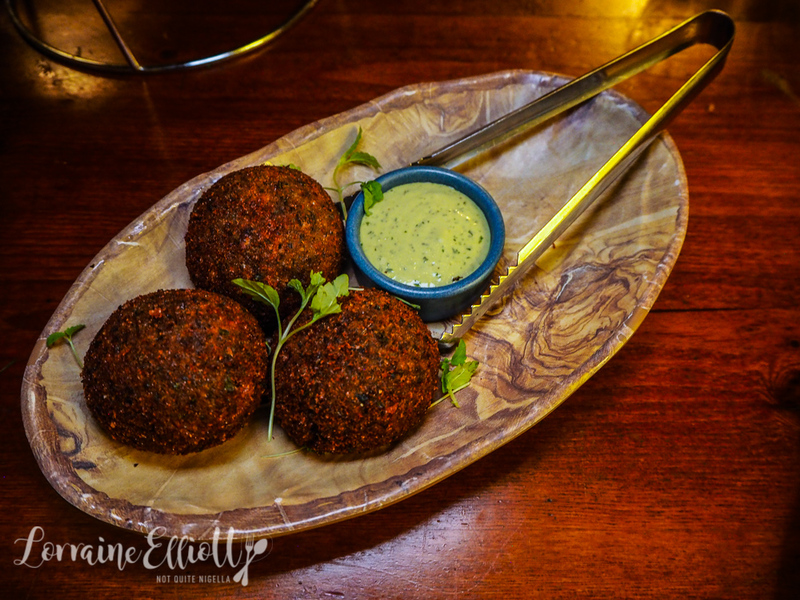 The mushroom arancini come out dark golden, crumbed and enormous with a basil aioli on the side. They're crunchy on the outside, soft on the inside and full of flavour-pretty much everything you'd want from an arancini. Iris and I had both earmarked the pork belly after having it at Richard's party. And it's pretty damn fabulous. The crackling is just so crunchy but not over salted and the meat melts in the mouth. It comes with a tangy salsa verde but I prefer it with the basil pesto cream from the arancini. 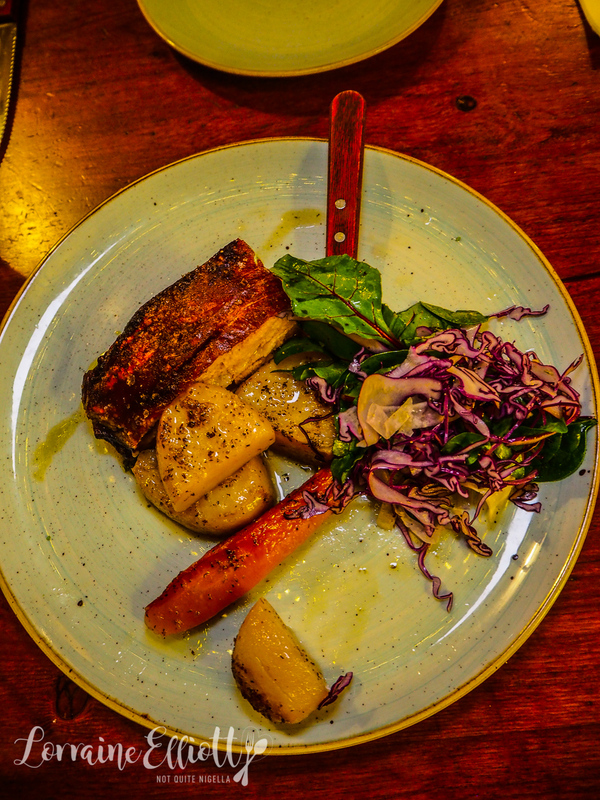 There are also lemony potatoes on the side as well as roasted carrot and salad. I know I could make this salad at home and I'm sure that I will. Perhaps what I love is the balsamic reduction that makes this sticky sweet and moreish. There are big shavings of parmesan cheese, whole walnuts and sun dried tomatoes in this salad and again I go for third serves of this I enjoy it so much. Whenever I see a diavola pizza I order it because I love spicy pizza. 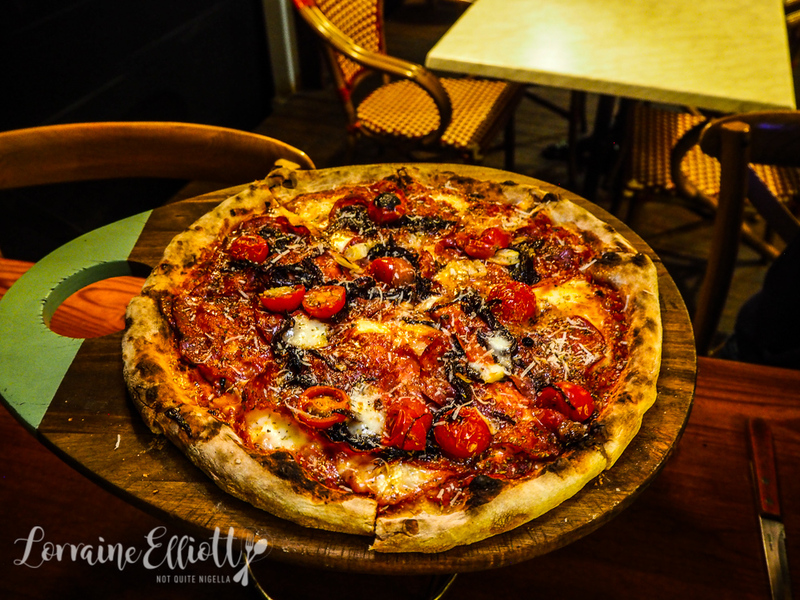 The diavola pizza here is a spicy, delicious mix of cherry tomatoes, fior de latte, hot sopressa salami, garlic, chilli and onion. And it's pretty good although I stick to one piece because there's so much on the table to try. 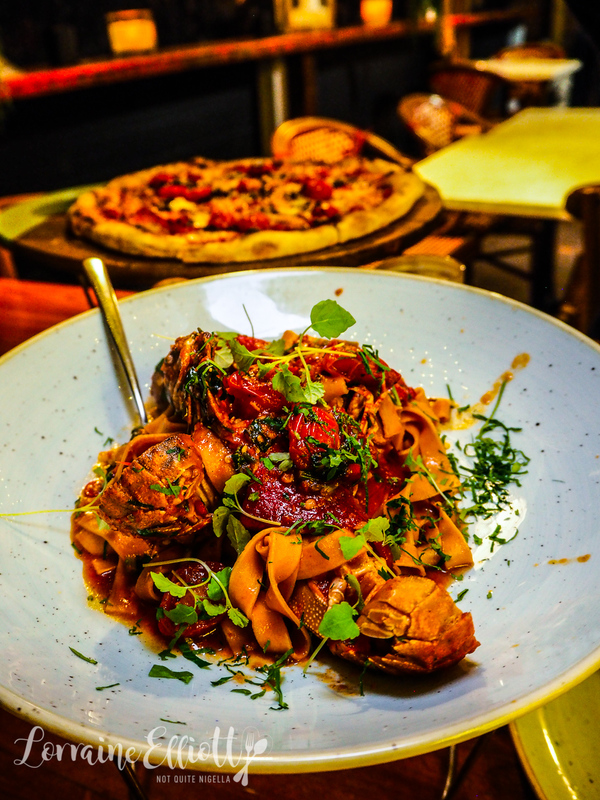 While we normally don't order specials because you Dear Reader can't order them (also honestly fettucine isn't my favourite pasta shape), we saw a plate of this go to another table and wanted it so badly that we had to break that rule. There are 2 balmain bugs (shellfish), split in half with a lightly spicy arrabiatta sauce redolent in garlic and chilli. The pasta is good although I think you only get a bit of balmain bug meat in a couple of mouthfuls. I think I prefer something like crab pasta where you can get a bit of crab meat in every mouthful. I do enjoy sucking on the shells of the bugs though getting all of the sauce. I wanted to love the desserts as much as the savouries but they just didn't wow me as much. 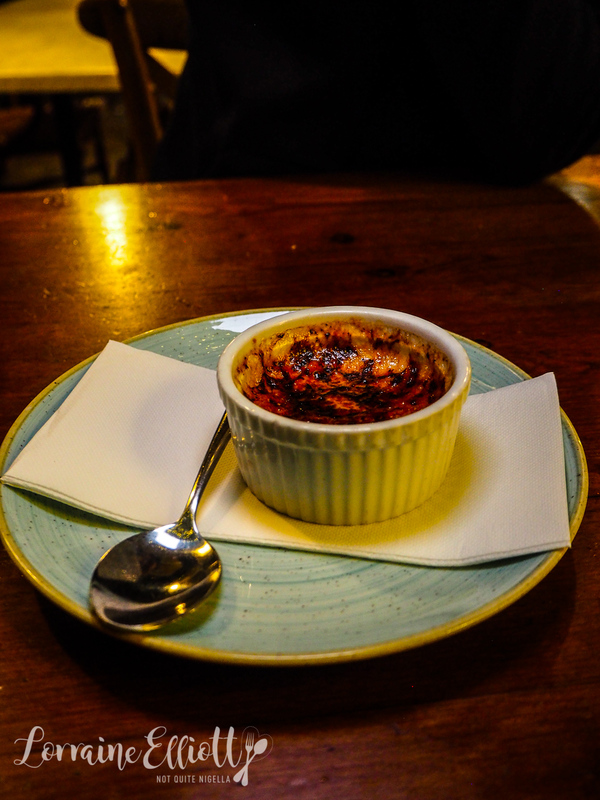 The crème brûlée has a nice flavour and a thin layer of toffee but it seems a meagre sized serve as it doesn't reach very high in the small ramekin. 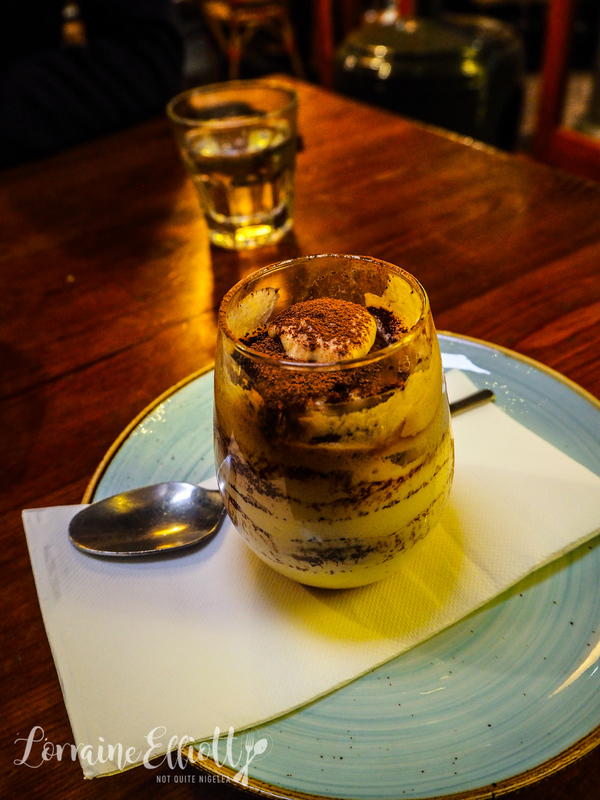 The tiramisu is wet on the bottom and dry on the top which makes me a bit sad as I love this particular dessert so much. Iris had even asked when it was made but they hadn't really given much of an answer. 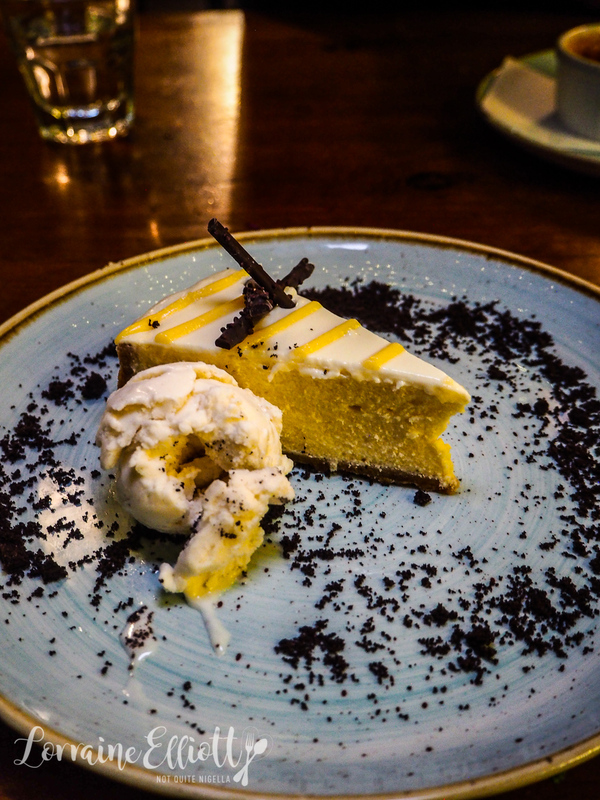 The pick of the three is the lemon cheesecake with a wedge of creamy, lemon topped cheesecake and crumbs surrounding it. 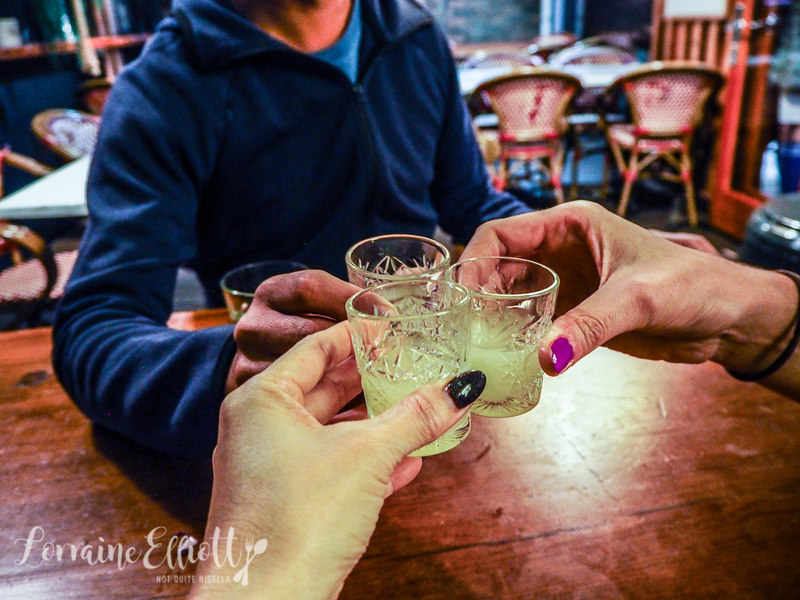 And to finish, glasses of limoncello to toast to finding hidden gems! 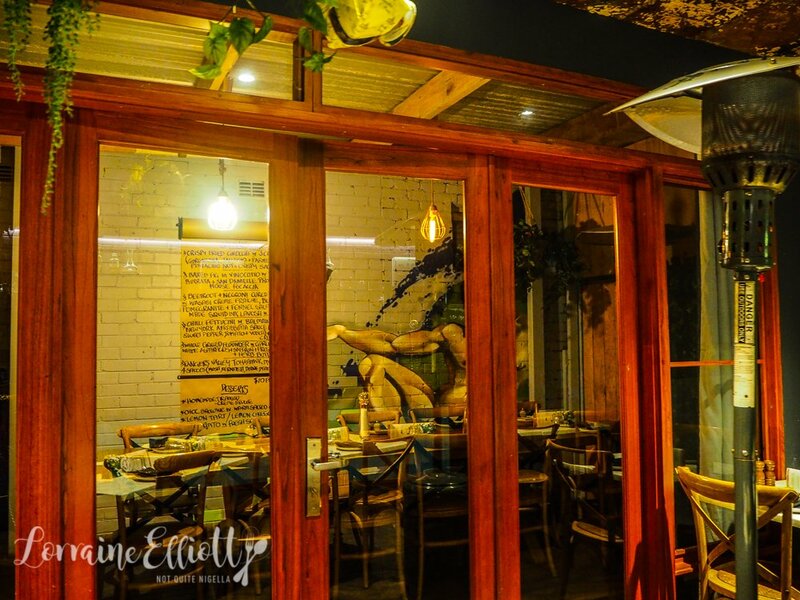 So tell me Dear Reader, do you find eating out with new people can be a challenge when it comes to agreeing on what to order? What is your regular pizza order?